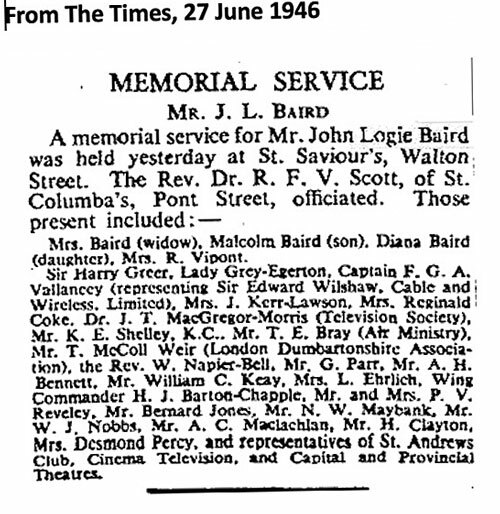 JOHN LOGIE BAIRD was the last man to wish to have any fulsome eulogy spoken of him, when he had passed through that final door of discovery and found the vision which satisfies and fulfils, in the "light that never was on land or sea". During his lifetime he never sought for honours — though if ever a man deserved them, he did. He sought to serve the cause of Truth and to enrich and brighten the life of his fellow men. He will be happiest, then, if we speak of his life and work now so that we who are left may learn from them the better to seek and to serve. His life was an object lesson in Faith. Many of you know the details of his great work far better than I do. But it is clear to all that the story of television is a story of faith. Against every kind of adversity and misfortune both in person and circumstance; in the face of ridicule and misunderstanding, Baird kept on, dogged, determined, unswerving. He believed he was right and in the end he succeeded. From small and flickering beginnings television became part of the standard equipment of civilised life. Some have said there was irony in the fact that when by this wonderful invention the Victory Parade was being shown to crowds in this city, the inventor was lying on his deathbed. There was no irony. For him, too, it was Victory Parade. "For this is the Victory that overcometh the world, even our faith." His life was an object lesson in friendliness. An inventor must always be, to some extent, a lonely man; his nature and occupation tend to make him that. Yet Baird was one of the friendliest of men. Those who worked with him and for him are able and willing to testify to that, nor will they readily forget how constantly sought to encourage, inspire and guide those younger and less instructed than himself. He showed the friendly spirit in another way. He always wanted the widest advantage to be taken of his work and discovery. He came, as I know well, from a people who can be strongly nationalistic. Yet he always desired that what he discovered and what he fashioned should be used in all nations and help their closer co-operation and better understanding. As he devised the noctovisor, whereby men might see through the dark, so he believed that only the ray of friendship could guide men and nations amid the darkness of division and hatred. The world stands desperately in need of these two great gifts, Faith and Friendship. We shall best honour Baird if we return to our tasks today determined that so far as we are able they shall shine more brightly in our work and in our fellowship. There is no doubt that the name of Baird will live. The creator of television will not be forgotten. His name will live in a happier world; a world in which there will be safety and security for our children if men everywhere remember those lessons of his life. For then the screen that showed the Parade of Victory will show at last the Procession of Peace. So may each of us live in faith and friendship until the flickering screen of time gives place to the vision of reality in which we shall find fulfilment and eternal life. 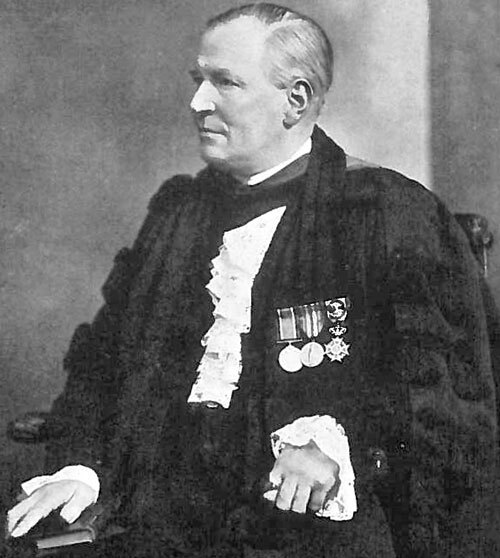 Photo of Dr Scott by courtesy of the Church of Scotland magazine Life and Work.